No, not really a catchup much, more of a restart! We’ve built a house and moved, kids are at 3 different schools, I’m managing 2 projects at work, I’m trying to find some time to read (Teenage parenting books seem to be the topic of choice lately). Also getting the sewing room set up. I’ve been involved in a project to make quilts for folks that lost their heirloom handmade treasures in the Nashville Area flood. Rainbow Around the Block. We have been enjoying the “wreck room”. We have a pool table, we seem to have lots of visitors, which is OK most days. If you don’t know about FreeCycle, it’s a great thing. It’s a service site where you can give away stuff you don’t want and maybe get some stuff you need/want “for free”. Recently I’ve listed, wire hangers, scrapbook magazines, 2 parakeets. The people that get the stuff feel like they’ve gotten a treasure! You can join groups in your area. You can get digests or emails of the stuff that’s being offered. The postings are moderated so nothing too rude comes across. I bought a cool necklace today! I’ve never bought a necklace at church before until today. Jared Miller the Director for an organization called Sisters of Rwanda spoke briefly at church today. The organization helps oppressed women in Rwanda to become financially independent. They make beads from “trash paper” and create beautiful necklaces. 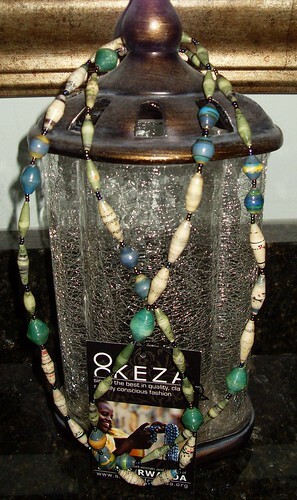 They have created a jewely line called Keza which is the word for “beautiful” in their language. I will add a link to the organization and here’s a picture of the necklace I bought today, love it!